The Leon X-Perience is Seat’s take on a small but worthy niche: the 4x4 estate car. With its raised ride height and four-wheel drive, the X-Perience should happily tow over a bumpy farm campsite, but with lower running costs and a more rewarding driving experience on Tarmac than many SUVs offer. The most powerful version finished second in its weight class at the Tow Car Awards 2015. Is the less-powerful model just as good and what tow car ability does it have? So, what are we looking for? We want a car that’s as tough as an SUV but as practical as an estate. We expect stable towing, the muscle to pull a family caravan, and a boot that swallows a fortnight’s holiday luggage. The advantages of choosing the four-wheel-drive Seat Leon X-Perience over a front-wheel-drive Leon estate go beyond the obvious benefit of improved traction; the X-Perience is also significantly heavier. Our 150PS (148bhp) test car had a kerbweight of 1484kg. That’s some 134kg more than the ST (Seat’s name for the estate). The 85% match figure, usually recommended as a maximum caravan weight for inexperienced drivers to tow, is 1261kg. The legal towing limit is 2000kg. Power comes from the Volkswagen Group’s 2.0-litre diesel engine, which now meets the Euro 6 emissions standard. Unless any new wrongdoing comes to light, that means this isn’t caught up in the emissions scandal and so is not subject to the recall of many group cars. It may give away 31bhp compared with the higher-powered version, but it tows at a decent pace. The flexible engine forgives the lazy driver for holding a high gear for too long. Maximum torque of 250lb ft arrives at 1750rpm and is held all the way to 3000rpm. The engine still pulls cleanly below this. Hitched to a Swift Expression 554 with a Mass in Running Order of 1197kg, the Seat accelerated from 30-60mph in 11.5 seconds. Once up to speed the Leon is happy to hold 60mph in top gear, with little need to change down to fifth on motorway inclines. We’ve no complaints about the Leon X-Perience’s stability once up to the legal limit. It’s quite happy at 60mph, and showed no signs of losing the plot at higher speeds on the test track. Long trips towing with the X-Perience should be relaxed and stress-free. It coped well with the lane-change test, too. On the very fastest runs we could feel some pushing and shoving from the caravan as it moved around dramatically behind the car, but the Seat’s precise steering and generous reserves of grip kept the car on course. If there’s space to brake rather than swerve to avoid an accident, the Leon X-Perience stops sharply and without undue drama. On a largely dry track, the car needed just 10.3m to bring the outfit to a complete stop. For the most part, the Leon impressed in the hill-start test. The car pulled to the top of the 1-in-10 slope in first gear and reverse without too much clutch slip. The only black mark is that the handbrake needed to be pulled on firmly to stop the outfit from rolling backwards. On a steeper gradient that could be a worry. We’d prefer the security of an electronic parking brake. Judged purely as a tow car, the Leon is close to complete. Four-wheel drive makes for secure towing in all weathers, the engine has plenty of muscle, and we’re happy with its stability. With an electronic parking brake the Seat might have scored five out of five. Leave the tourer behind and the Leon X-Perience continues to impress. The strong mid-range pull makes for easy overtaking – there’s no need to go for the more powerful model unless you want an automatic gearbox (all 150PS cars are manuals while all 184PS models are autos). The raised ride height of the X-Perience doesn’t spoil its handling. There’s a little more lean than when driving the standard estate, but the X-Perience still corners neatly and steers with precision. It’s more fun to drive on a country road than most SUVs, especially if you make use of the Seat Drive Profile feature; select Sport mode for sharper throttle response and weightier steering. Seat markets itself as the sporty brand in the VW Group, which is reflected in the Leon’s suspension. It’s firmer than the Škoda Octavia Scout’s, which makes the Leon a bit less forgiving of potholes. At higher speeds, it smoothes out somewhat, but if ride comfort is a priority, you’ll prefer the Škoda. At motorway speeds that firmness translates to a very stable drive, although road noise can be intrusive. You can buy a VW Passat Estate for similar money (albeit without four-wheel drive), and it’s a much quieter motorway car. The Leon X-Perience is an enjoyable solo drive. A slightly softer ride and less road noise at speed would make it even better. Aside from a few badges here and there, the interior of the X-Perience will be familiar to anyone who has driven the Leon ST. The dashboard is clearly laid out and the air-con is controlled by conventional dials and buttons, rather than a touchscreen. That’s fine by us, because it makes adjusting the temperature or fan speed on the go easier than if you have to scroll through on-screen menus. There’s plenty of room in the front of the Seat Leon X-Perience for the driver and front seat passenger. There’s a broad range of adjustment for the seat and wheel, and the pedals are well spaced, so it’s simple to find a comfortable driving position. Space isn’t quite so generous for those in the back. There’s less legroom than you’d find in the back of a Škoda Octavia Scout but, unless the driver and passenger are both tall, that shouldn’t be a problem. The optional full-length sunroof (£995) limits headroom, although it does allow lots of light into what’s otherwise a very dark cabin. It’s good to see air vents between the front seats to serve rear-seat passengers, although the big transmission tunnel can get in the way if there are three people travelling in the back. You won’t need to travel light when you go on caravan holidays in the Seat. There’s a massive 597-litre boot capacity. With the boot floor set to its highest setting, there’s only a tiny lip to lift items over and hidden storage below, which could be used to keep muddy boots away from clean bags. Levers on either side of the tailgate make folding down the back seats quick and simple, which extends the luggage space to 1470 litres. You can buy competitors with a little more space for rear-seat passengers. Otherwise this is a very practical car. You’ll pay £26,905 for the Seat Leon X-Perience 150PS in SE Technology spec, if you go by the list price. Apply the thumbscrews and What Car?’s researchers suggest that should fall to near £23,729 – a big saving on a car that hasn’t been on sale for a full year. If that price is still too stiff, you can have the same car in SE spec for £24,920 before haggling, or £21,943 afterwards. Go for the SE Technology specification, and there’s a pretty comprehensive list of standard equipment. Upgrades over the standard SE spec (which isn’t exactly stingy) include front foglights, full LED headlights, electrically folding door mirrors, sports seats with Alcantara upholstery, rain-sensing wipers, automatic lights, an auto-dimming mirror, sat-nav and 18in alloy wheels. Running costs should be low. The official combined figure is 57.6mpg, and we regularly saw better than 50mpg in solo driving. While towing the Swift on a mix of A-roads and motorways we achieved 30.5mpg. The car sits in group 26E for insurance. If that’s a concern, SE spec is six groups lower. After three years and 36,000 miles on the road, What Car?’s experts predict the Seat will be worth 44% of the original price. That’s a reasonable return, given the generous discounts up-front. The Seat Leon X-Perience ticks most of the boxes for a £27,000 tow car. Even if you prefer hardstanding pitches and only tour in the summer, the time will inevitably come when you’ll be glad of four-wheel drive. If you do tour year round and regularly stay at farm campsites, the value of sending power to all four wheels can be in no doubt. At a time when new cars keep getting lighter, the extra weight of the four-wheel-drive transmission is another benefit, improving the Leon’s matching ratio over that of the two-wheel-drive Leon ST on which it’s based. The 150PS diesel may be the less powerful of the two available engines, but it never felt short of towing muscle. It’s flexible and impressively returns better than 30mpg while towing. Stability is another strength. 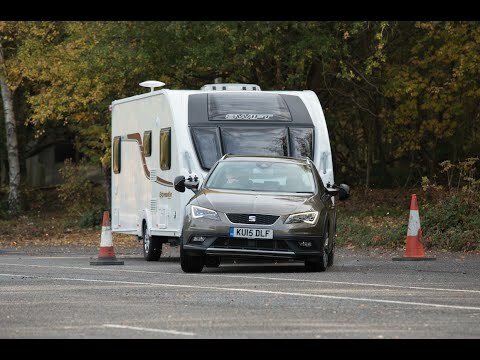 We had no nervous moments towing with the Seat, and both the lane-change and braking tests proved the Leon’s credentials in an emergency manoeuvre. We’d prefer an electronic parking brake when making hill starts, but it’s certainly not a deal-breaker. In everyday driving, the Leon is good fun, although we’d prefer a slightly softer ride and a little less road noise. The Leon’s close rival, the Škoda Octavia Scout, is more practical if you have teenage children, thanks to its extra rear legroom. It has slightly more boot space, too, but few will complain about the Leon’s boot. We only have minor criticisms of the Seat. It is a thoroughly capable, all-round tow car.